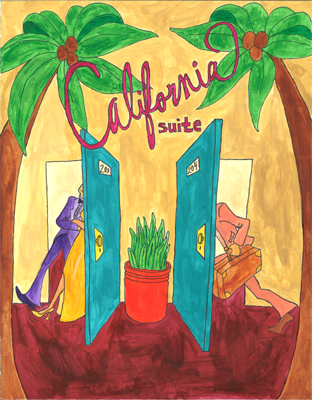 Playwright Neil Simon’s California Suite is a comedy consisting of four playlets whose action takes place in rooms 203 and 204 of the Beverly Hills Hotel in 1976. This is Neil Simon at his best—a humorous confection that will definitely make you laugh and warm your heart! In Visitor from New York, a divorced couple, Bill and Hannah Warren, have met in the suite in order to discuss who will get custody of their teenage daughter. In Visitor from Philadelphia, Marvin Michaels finds himself in a very difficult position when his wife comes to meet him in the suite. In Visitors from London, Sidney and Diana Nichols are a couple from London who have rented the suite to attend the Academy Awards. The Visitors from Chicago are two affluent couples who are best friends and have come to Beverly Hills for a vacation which takes a turn for the worst after a mixed doubles tennis match. who will get custody of their teenage daughter. when his wife comes to meet him in the suite. Sidney and Diana Nichols fortify themselves before attending the Academy Awards. Things take a turn for the worst after a mixed doubles tennis match. meet in the suite to discuss who will get custody of their teenage daughter.